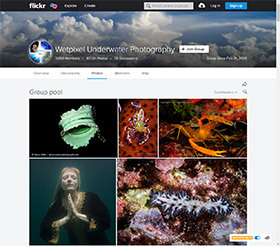 Wetpixel is the premiere community website dedicated to underwater photography and videography. With up-to-date news, articles, gear reviews, photo contests, and dive expeditions, Wetpixel is a strong, focused community of over 20,000 underwater photographers. Wetpixel was established in 2001 by Eric Cheng and is now owned and published by Adam Hanlon. Our volunteer team includes Dr. Alexander Mustard, Cor Bosman, Drew Wong, Abi Smigel Mullens, and many others. In 2003, Eric and Wetpixel were awarded the prestigious Antibes Festival prize for Best Website. We would love to have you join our community! It’s free and only takes a few minutes. You may also reach us by using our feedback form. Before sending mail, please do a cursory search in the forums. Wetpixel.com is absolutely the best source of up-to-date information in the digital underwater photography world. With the incredibly fast rate that digital photography advances, it is impossible to keep up on all the changes, which is why I use wetpixel.com as my main tool to keep up with the progress. At this forum, photographers from all over the world share information making it quite simply, the best resource on the planet for digital photography! In our rapidly-evolving world of digital technology, it could be a full-time job searching the internet for what is new, and what works and what seems like a good idea and still one could be filled with misinformation and lost in confusion. For the frequently traveling underwater photographer, even that research is at best piecemeal due to long periods of time without high-speed internet access or access at all. Fortunately, we have WETPIXEL, an all-inclusive site that provides up to the moment press releases combined with often skeptical and thankfully critical evaluations of the newest gear and best applications to the underwater field. WETPIXEL is deliberately straightforward and geared for the serious underwater photographer. The world would be a lesser place without it and the dedication of its hard-working administrators Eric Cheng and James Wiseman. Thank you thank you thank you. The blog-o-sphere is full of misinformation, but Wetpixel has a strong set of administrators that keep the facts straight. I consider Wetpixel one of the greatest services in the underwater imaging community…. keeping us communicating, informed and inspired. Unfortunately, Eric Cheng is a whiner and smells really bad, but this site helps keep him off the streets. Wetpixel has replaced all my other sources for information on the technique and equipment of underwater photography. If I need to find information on a new camera, a new flash unit, or housing, then I go straight to Wetpixel to do my research. The amount of information contained on this site is phenomenal, as well as being well-organized and easy to find. Congratulations to the moderators and organizers of this fine site. I consider it to be the best and most comprehensive source of information on underwater photography today. Skip my old, outdated book on underwater photography and go straight to Wetpixel instead.